The photo above shows one of the marinas near us. 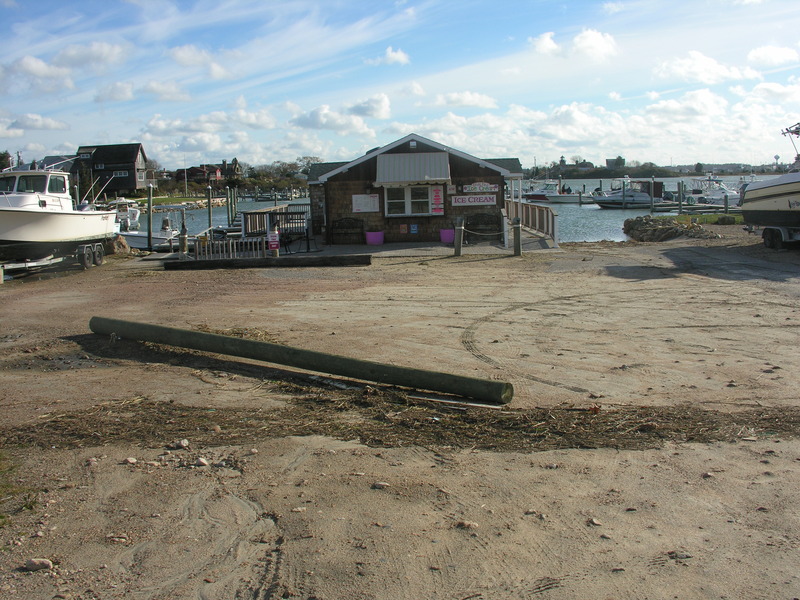 The parking lot was scoured by the high water and you can see the poles lying there, but the building itself is unscathed. Amazing, considering that at one point, the wind gusted to over 90 miles per hour. Notice how beautiful the sky is, though. It usually is after a powerful storm. 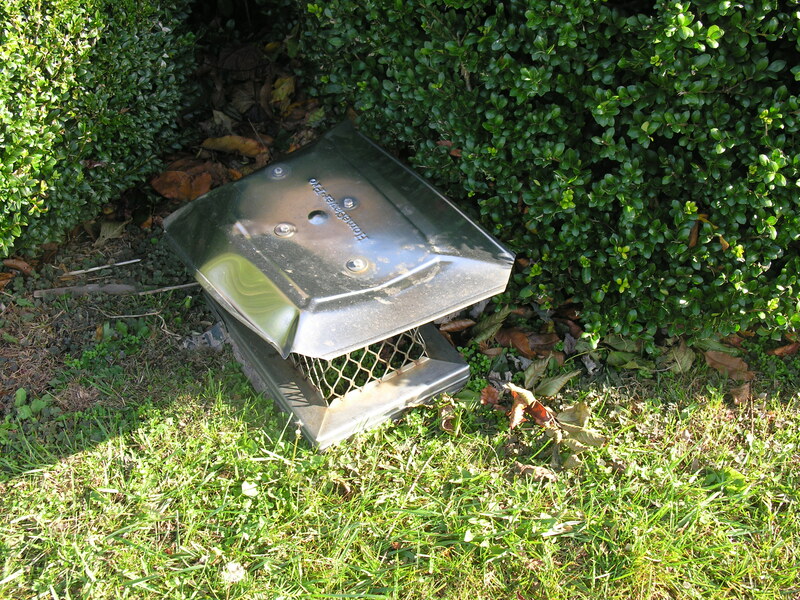 This is our chimney cap, lying on the back lawn. I remember hearing it break off and hurtle to the ground sometime on Monday evening. We lost a good part of our roof, and today, work has begun on a new one. We got our power back a day ago, and the house is warm and cozy. I put away all the “storm stuff” and we are once again able to enjoy hot showers – little things, but important. 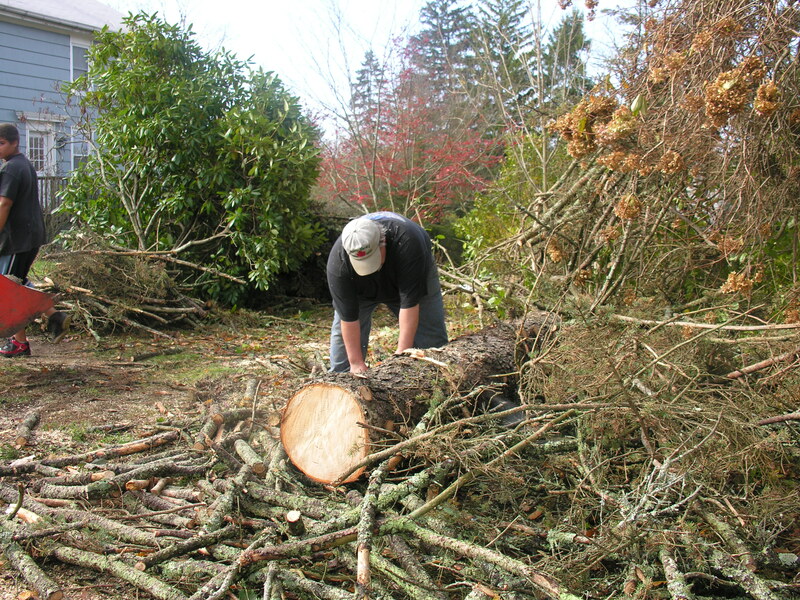 Here’s my friend, Tom, cutting up a huge spruce that was uprooted and came down on his truck. And here’s the poor truck. 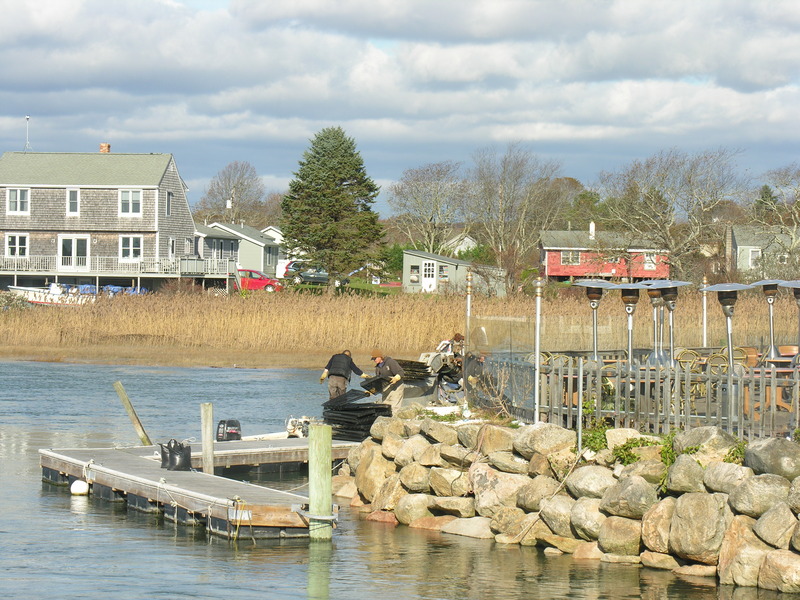 The oyster farm guys were busy getting back on the water. 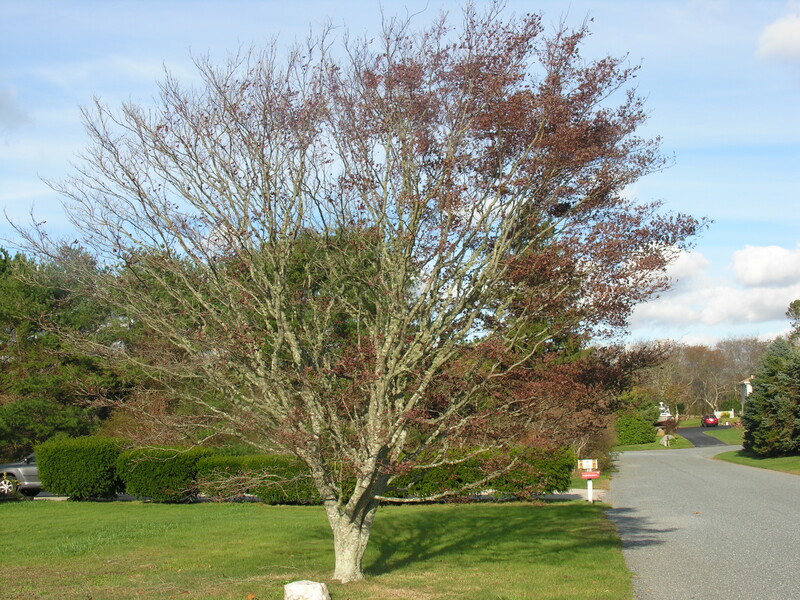 This Japanese maple still has salt damage on its windward side from Irene last year. It took another major hit this time. All the trees around here were damaged by the salt in the wind. Looking back, I would say that my most useful pieces of emergency equipment were my camp stove and my headlamp. The stove allowed me to make coffee and soup and hot suppers like pasta, which made life a bit more bearable. The headlamp, which I use when I go backpacking, was indispensable, especially when I had to go down into our cellar. These linemen in the blue hats drove three days from Alabama to get to RI. Here they’re receiving instructions from a local power company man. We are very grateful for their help. I was pretty frazzled by the time the power came back on, but it’s hard to complain when people in New York and New Jersey are suffering so much more. Thanks to all the readers who cared enough to ask how we were doing. That meant a lot. 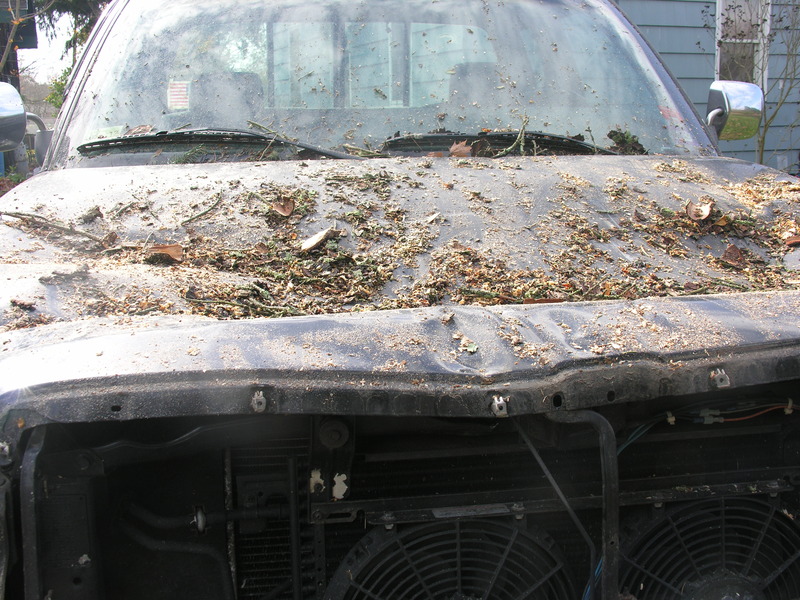 Your images say a lot about how damaging that storm was, including the tree that smashed your friend’s truck. I’m glad you got through unhurt. All best. Thanks, Lee. I’m still cleaning up around here, but I’ll be done soon. I’m glad you made it through the storm in good health, dn. I’m sorry to hear about your roof, though. Thanks, CJ. We really needed a new roof anyway and like the contractor said, part of the demolition was already done for him! ah just catching up – that’s a very upbeat way to look at replacing your roof. Hope you are all back to normal, bar the memories, now. Glad to hear you weathered Sandy. A lot of us around here counting our blessings this week. nights in a row. The Charlestown homes along the beach were devastated, and I particularly am keeping those in New Jersey and Staten Island NY in my thoughts and prayers. Glad you’re safe and sound there DN. I promise to get that blog to you soon! I should’ve sent it prior to Sandy! No rush, Kathy. Glad you made it. Jealous about that generator! Glad to hear you have surfaced and survived. missed you at the hotline class last Friday. Well, I do have this thing called “a full time job,” so no time for volunteering, I’m afraid! Now I’m looking ahead to that nor’easter…. what a mess. My husband just heard his favorite place – The OCean Mist, what not damaged. But sounds like most of the other waterfront joints are beyond repair. I know. That is so strange how the Ocean Mist survived this and other storms. But there will come a day when it won’t. There is literally no beach left there.